Anyway, there's a movie coming out called Moms' Night Out. I was invited to a screening last month, but it fell on my birthday, and I honestly just wanted to spend my birthday with my family - kids included, so that's what I did. I've heard great things about the movie, though - and who doesn't love Sean Astin, right? The movie opens May 9. I think it looks fun. And seriously, way more traumatic than a moms' night out should be, but funny when it's happening to someone else. The movie premiere will take place in LA. I'd love to go, and I can't imagine why you wouldn't - especially if it's on someone else's dime. Right now, eMeals.com is offering up the chance to win an ALL EXPENSES PAID trip to LA to attend the premiere (valued at about $2000) this month! Just go HERE and fill out the form. This contest runs through the 20th, so you have just less than a week left to put your hat in the ring! And just for entering, eMeals will send you some yummy recipes they've created inspired by characters from the film. Just to wet your appetite, I'll go ahead and share one of those delicious recipes now! Because, who doesn't love the combo of bacon, pancakes, and maple syrup? Cook 6 slices bacon in a skillet until crisp, and crumble. Combine cornmeal mix, flour, and sugar in a medium bowl. 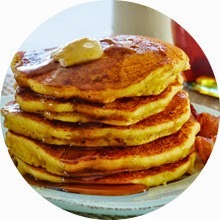 Whisk together buttermilk, eggs, 4 tablespoons oil and vanilla in another bowl. Add to cornmeal mixture, stirring until blended. Brush a large nonstick skillet with remaining 1 tablespoon oil; heat over medium heat. Pour about 1/3 cup batter onto hot skillet for each pancake. Cook until tops are covered with bubbles. Turn and cook other side until golden brown. Garnish with additional bacon, if desired. Don't forget to enter for your chance to win the trip to the Moms' Night Out premiere! It's so easy, you could do it while eating these pancakes.